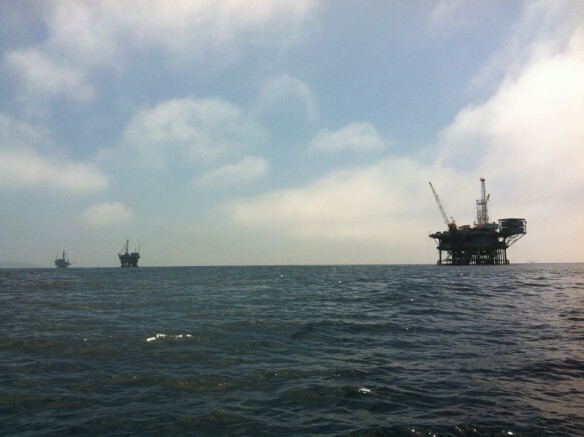 Oil platforms, Summerlamd. Photograph: © SAF — Coastal Care. Old wells, new problems: Once upon a time, Summerland, California, was the offshore oil drilling capital of the county. And while the wells were abandoned nearly a century ago, many Summerland residents feel that the unprecedented amounts of oil washing up on their beaches in recent months may be the result of these old petroleum-harvesting spots. Santa Barbara historical museum. Summerland resident stumbled upon something he knew existed, but had never seen before at Summerland Beach. There are dozens of old wells at Summerland Beach which was once a bustling oil field, pumping out oil and gas from the Santa Barbara Channel. The Summerland Oil Field was developed in the 1890s and has the distinction of being the location of the world’s first offshore oil wells.